Dr. Lee applying the Blue Peel. Permission given for picture usage. Results from peels and lasers come from similar mechanisms of skin resurfacing. There are many arguments regarding which is better because they both treat similar aspects of aging skin. The blue coloring of the Blue Peel helps the practitioner gauge the depth and consistency of the peel. Lasers have dials that increase/decrease the strength of the energy. At Surgical Artistry, we currently only have a vein laser. Thus our experience is greater with chemical peels for facial skin resurfacing. There are also so many different lasers and there are also so many different chemical peels. The comparison is difficult. There's also differences in pricing - yet another consideration. Lasers (and other energy based devices such as RF) usually cost more than chemical peels due to the cost of the equipment and maintenance. Room for Confusion: Two different Blue Peels. Obagi makes two peels with the name "blue peel" in it. They make the Obagi Blue Peel RADIANCE, and the Obagi Blue Peel. I'll refer to the Obagi Blue Peel as the Original Obagi Blue Peel. Radiance peel we consider a medium level peel for non-sedated patients. The Original Blue Peel is a deep level peel for non-sedated patients. There are peels as well where the patients get sedation. Those peels are covered elsewhere. This link leads to more information about the Blue Peel Radiance at Surgical Artistry. Another point of confusion. Obagi makes many different skin care products and lines, along with different peel offerings. Obagi is a skin care company, not one particular product. Hope that clarifies things a bit. Regarding "deep" and "medium" level peels. I'm using these words to describe the peels relative to each other on awake patients. There are even deeper peels that could be used, but we'll save that for another discussion, and another webpage, and another level of consciousness (patients are sedated for those peels). No pretreatment regimen needed for our Blue Peel Radiance. Can choose from 1 layer to 2 layers. Most of our patients choose 2 layer peel. Deep level for awake patients. We require at least 2 months of pretreatment with Tretinoin for the Blue Peel Original. Preferably using the whole Obagi Nu-derm skin care line. 6-10 days of moderate to severe peeling. Some patients say they look they got a burn on their face. There is blue dye in the peel to allow for a very even application, and the ability to "feather" out the edges so that there is no heavy demarcation between peeled skin and non-peeled skin at the neck. Can choose from 1-4 layers. Most of patients choose a 3 layer peel. Can also choose the strength of the peel. 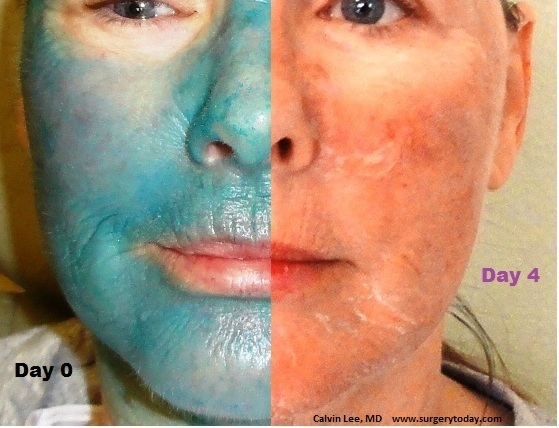 Costs about $850 for a 3 - 4 layer Blue Peel at Surgical Artistry by Dr. Calvin Lee, Surgeon. About $450 for a 1-2 layer Blue Peel (original-deep). Everyone is different. One could get a second peel as soon as 1-2 months after the first peel, and subsequent peels could be considered a year later. In between, maintenance with the Obagi Nu-derm system works well. How about the Neck or chest? The Blue Peel (Original-deep) could be used for the neck and chest, but we would use a lighter application of the material. More of the peel would usually be needed. It could be used for other areas of the body as well. We usually recommend at least 2 months on the Obagi Nu-derm system - this system includes exfoliating regimens with Obagi's Exfoderm forte or plain Exfoderm. If one isn't on the Obagi Nu-Derm system, with selected patients, we recommend at least 2 months with tretinoin cream 0.05%. This preparation is an essential part of getting good results from a TCA based peel such as the Obagi Blue Peel (Original-deep). The prepping of the skin will result in a more even penetration of the chemical peel and allow for more predictability and faster healing time. Consider taking about 10-14 days off from work if possible. If you have cold sores, consider getting a prescription for acyclovir or equivalent (available from us too - we can call it into your pharmacy). Day One after your chemical peel - you may still be bluish colored, but very lightly. Use a gentle cleanser to help remove the blue coloring. Use vaseline as needed to moisturize your skin every 2 hours while you are awake. Sun protection as always, is especially a must. Hold off on using these Obagi products: Clear, Exfoderm, Blender, Sunfader, and Tretinoin. So the products you can use are: Cleanser, Toner, Sun Shield (or other sun block with zinc oxide). Sun block can be applied over vaseline. Re-application of sun block is essential - even if indoors. UV light (UV-A) can penetrate through windows. 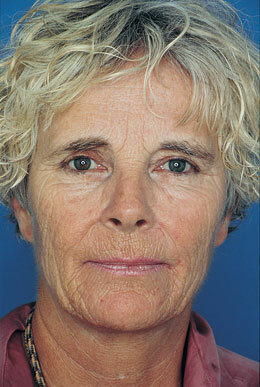 Some patients find that if they keep their heads elevated, they will have less swelling in their face. Most patients don't experience much swelling. Day Two - same as day one but at this point the blue color should be about 95% washed off. Your facial skin will feel tight and may itch a bit. Day Three - consider switching your moisturizing strategy to Obagi Action every two hours. Your skin will be very dry and dark spots and lines may look worse today as the peeling starts. 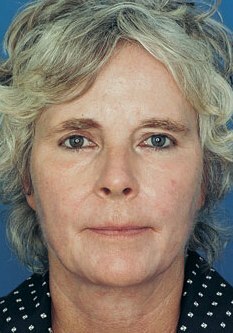 Areas around the mouth and nose usually start peeling first. Day Five, Six, and Seven - no changes. Day Eight - consider returning to your Obagi regimen if your skin is no longer peeling. Consider continuing the Obagi Action for another few more days then after that, you are back to your regular skin routine. Click here for after-peel instructions (very similar to above but written in a different way). Meanwhile, we will be available to see you and guide you on your progress over the first 2 weeks. You can see us every day after the peel if need be for frequent check-ups. Every patient is different and every practitioner does the peel slightly differently. These are our generalized directions. Please see your Obagi Blue Peel specialist for specific guidance. Pictures used with permission (actual Blue Peel patient). Thank you. On the left is the blue color added to the facial peel acid that helps to keep the peel even, and allows for lightening / feathering of the peel near areas of skin that aren't receiving the peel such as the skin right around the eyes. On the right is 4 days after the peel where the skin peeling and some redness can be seen. Above is an original picture by Dr. Lee, used with permission. I have seen some patients peel worse than this. My purpose of putting this picture up is so that potential Blue Peel patients can get an idea of what to expect. I think the peeling is worst around day 4. The following pictures are from the Obagi advertising material. The small print on the advertising material states that she has been on the Obagi Nu-derm system before and after the Blue Peel. We feel the same way - that it is important to be on the Obagi Nu-derm skin care system before and after the peel. Even without the Blue Peel, we feel that the Obagi Nu-derm skin care line is amazing. Surgical Artistry webpage is for information only, not medical advice.